The best time to visit Bali is generally during the summer months of June, July, and August when the weather is driest and the days are sunny. Unfortunately, that's also when the island becomes the most crowded—you won't be the only one in search of surf, sand, and sun! The opportunity to escape the Southern Hemisphere's winter months is just a little too tempting for tens of thousands of Australians who grab short, inexpensive flights up to Bali. No matter the time of year, expect Bali to be bustling. The island only goes from busy to busier. In fact, a majority of travelers to Indonesia, the world's largest island nation and fourth most populous country, only visit Bali. It's not for lack of choices in Indonesia. Bali is just one of more than 8,800 named islands in Indonesia, plus the many more unnamed islands in the archipelago. If you don't mind heavy traffic and sharing crowded beaches, go when the weather is best. July and August are often the driest months with pleasant temperatures. A good compromise is to risk occasional rain showers in exchange for more peace. The shoulder months before and after the high season (particularly April, May, and September) are enjoyable and experience many sunny days. The wettest months to visit Bali are from November to March. December, January, and February are extra rainy and a little hotter. These are the peak months in Thailand and countries north of Indonesia that are celebrating their dry seasons before the heat really moves in. Despite the rain and slightly hotter temperatures in December, Bali still becomes busy with revelers during Christmas and the New Year holiday. Although Bali is warm and comfortable throughout the year, the island has two distinct seasons: wet and dry. Unsurprisingly, the number of visitors increases as sunny days increase. Everyone's favorite island activities, particularly sunbathing, trekking, and motorbiking, are far more enjoyable without monsoon rain. Temperatures in Bali during July and August range from the 70 degrees Fahrenheit (21 degrees Celsius) to 80 degrees Fahrenheit (27 degrees Celsius), and December and January isn't too far off either. Bali is situated just 8 degrees south of the equator and enjoys a tropical climate. Those factoids become a sweaty three-shower-a-day reality once you wander too far from the breezy coast. Humidity often hovers around 85 percent. One exception is the green Kintamani region north of Ubud in the interior. Mount Batur provides enough elevation to even make weather chilly and drizzly some days for travelers on a motorbike. Traveling during the dry and high season doesn't guarantee all sunny days. Mother Nature keeps the island green throughout the year. Even during the dry season, you'll want to be prepared for brief pop-up storms. Although rain doesn't exactly make for a nice day on the beach or exploring the island's interior, there are some advantages to visiting Bali during the "green" season. You'll get better deals on accommodation and can upgrade to nicer rooms for the same price you would ordinarily pay for a budget guesthouse. With a few insider tricks, you can score great deals on hotels in Bali. Plus, fewer tourists will be clogging popular hotspots such as Ubud. You may have attractions such as Goa Gajah (the Elephant Cave) to yourself. During high season, you may have to wait to go inside. Also, the air is cleaner. Less dust and particulate matter from fires hang in the air. And finally, interactions are sometimes friendlier when locals are not so overworked during peak season. Of course, visiting during the low season has its downsides, too. Sometimes consistent downpours span for days while others dissipate within an hour. You never know. Plus, humidity is much higher, making the heat feel that much worse. Mosquitoes are much worse between rains, making dengue fever more of a threat on the island. Visibility at dive and snorkel sites is often worse because of sediment washed into the sea. Rougher seas may make boat trips less enjoyable. The drawbacks sound less than appealing, but many travelers prefer to visit destinations only during the low seasons. Why Is Bali So Popular? Perhaps because Bali is predominantly Hindu rather than Muslim or Christian, it boasts a unique vibe that differs from surrounding islands. No matter the reason, Bali is always a top destination in Asia. Bali has been a popular stop for backpackers on the Banana Pancake Trail for a long time. The island is also a famous surfing destination in Southeast Asia and a top honeymoon spot in Asia. Elizabeth Gilbert really spread the word with her hit book Eat, Pray, Love. Julia Roberts starred in the 2010 movie of the same name, opening the floodgates to Ubud. Prior to 2010, Ubud was mostly quiet and attracted budget travelers interested in a healthy alternative to the raging parties in Kuta. But Hollywood isn't as much to blame as geography. Backpacking students and Australian families—along with plenty of retired expats—choose to escape cooler weather in the Southern Hemisphere by grabbing cheap flights to Bali. 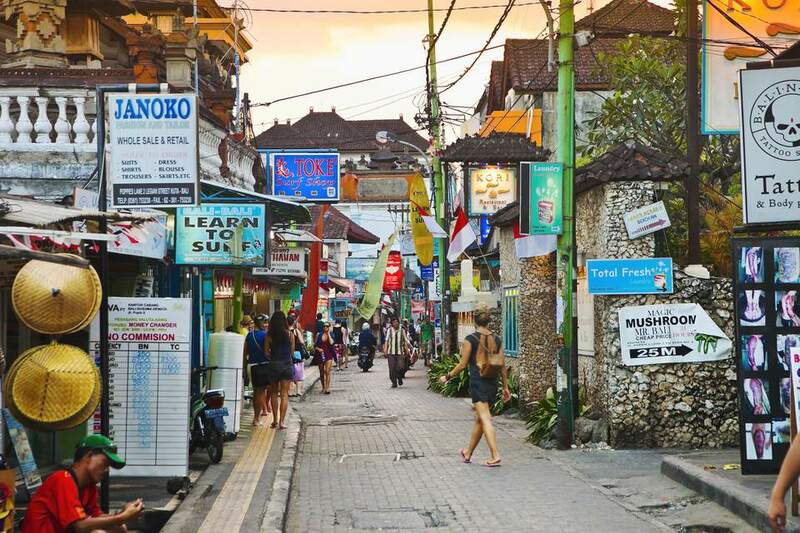 With many students out of school during the summer months, party epicenters such as Kuta become rowdy as young revelers come to enjoy the nightlife. The atmosphere along Jalan Legian resembles what you would expect at some American beaches during college spring break. Fortunately, there are plenty of lesser-known places along the coast: Amed, Lovina, and Padangbai still offer escape. And if things really get out of control, the nearby islands of Nusa Lembongan and Nusa Penida are tempting. Spring brings rain to Bali in March and temperatures can be quite hot. However, wait a month and you'll find April to be much more comfortable, and the dry season begins in May. Spring is a popular time for surfing off the island. Nyepi, the Balinese Day of Silence, falls on the Hindu New Year and will certainly affect your trip—but the night before is a lot of fun! For a full 24 hours, tourists are expected to remain inside their hotels and no noise is permitted. The beaches and businesses close—even the international airport shuts down! Nyepi hits in March or April, depending upon the Hindu lunar calendar. The colorful festival of Holi is usually celebrated in late March. What is summer for most Westerners is winter in Bali. It's also the best time to visit if you prefer warm and dry weather (although locals consider July and August "cold"). There are occasional rains, but nothing like monsoon season. Hari Merdeka (Indonesia's Independence Day) on August 17, may also affect travel to and from Bali. Indonesians also enjoy visiting Bali and come from as far as Sumatra and other places in the archipelago. The Bali Arts Festival is a long-running festival that is among the most popular in the country. The festival traditionally starts on the second Saturday of June and runs through mid-July. While Indonesia as a whole doesn't truly have an autumnal season, the stretch of months from September through November begins with clear, dry weather. In November, there are fewer tourists but if you hope to swim, the seas can be rough at this time. The Nusa Dua Fiesta is a fun week of art exhibitions, cultural performances, and more along Bali's southeast coast. It's typically held in October or November. Among Bali's most popular events, the mekepung (buffalo) races are held throughout the fall in Negara. December kicks of Indonesia's summer season. Humidity is high and hours of thunderstorms aren't unheard of. Warm seas have rough waters, making swimming less than ideal, but February conditions are great for surfers. Galungan is the most important religious holiday in Bali. It marks the time when the ancestral spirits visit the Earth. As with all popular destinations in Asia, Lunar New Year (dates change from year to year) draws a crowd, despite rainy weather in January and February.